Home > Eye Treatments > Lasek and Lasik Eye Surgery: What is the Difference? LASIK, laser-assisted in situ keratomileusis, to give it its full title, is a form of laser eye surgery commonly done to correct visual defects such as, long sight, short sight and astigmatism. It is often paid for privately and enables people with common eye problems to be free from wearing glasses or contact lenses. LASIK was first developed in Colombia in the 1950s and was perfected in Russia in the 1970s and in the USA during the 1980s. LASEK, laser epithelial keratomileusis, has the same effect and is also a form of laser eye surgery, but it uses a different technique. LASEK eye surgery, also known as photorefractive keratectomy (PRK), has been developed more recently – the first LASEK procedure was done in 1996. The aim of LASIK is to reshape the cornea, the outer surface of the eyeball, to change its shape and to change the focus of light coming into the eye so that this is exactly on the retina instead of in front of it or behind it. The laser is used to physically sculpt the part of the cornea through which most of the light falling on the retina passes. This is done by lifting a flap of tissue cut from the very surface of the cornea first – all of the remodelling is done on the lower layers – and then the flap is put back into position to heal naturally. No stitches are needed. As LASIK was developed, eye surgeons used to use a microtome blade to cut the flap in the cornea before completing the laser surgery but today, a laser is used. This is generally a femtosecond pulse laser, which is different to the laser used to reshape the cornea. The latest techniques also used the wavefront LASIK technique, in which the remodelling done by the laser is controlled very precisely by computer rather than by the surgeon directly. 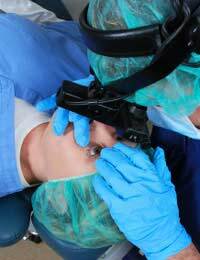 LASEK also involves using a laser to remodel the shape of the cornea but instead of using a blade or another laser to cut a flap in the corneal surface first, a dilute preparation of alcohol is used to flood the eye. This causes the surface layer of the cornea to detach, and this is carefully lifted up out of the way. It is damaged in the process so cannot be put back. After the laser reshaping of the underlying layers of the cornea is complete (this part of the procedure is very similar to that used in LASIK), a specially designed soft contact lens is put over the treated corneal surface. This allows the raw cornea to heal over the next four days, when the contact lens is removed. The techniques used in LASIK and LASEK eye surgery to expose the cornea for laser treatment are subtly different but do impact on recovery time. If you have LASIK, your recovery times are slightly faster; 2-5 days rather than 4-7 days. After LASIK you can drive after about 3 days but if you have LASEK you should wait at least a week. Visual improvements also tend to be quicker with LASIK. If you have LASEK, you can still expect positive changes in your vision for 6-8 weeks. The final choice of procedure will depend on your surgeon and eye specialist and you should take their advice. LASIK causes less pain during recovery and produces results more quickly, but it is only suitable for people whose cornea is fairly thick. Having a thin cornea really restricts you to having LASEK, as the lack of corneal tissue makes it difficult to cut a flap. If you tend to have dry eyes, your surgeon may recommend LASEK as this tends to have less risk of dry eye after surgery. More patients who have LASIK will have dry eyes for up to a year following their treatment.